The Dana 44 Bombshell can now be used on STOCK Jeep Wrangler JK and TJ, front or rear axles, with no requirement for aftermarket track bars or suspension modifications! Now you can install the Bombshell Dana 44 Diff Cover on to your bone stock Jeep, straight off the showroom floor! This re-design also includes moving the gear oil fill hole to the stock fluid level height so there's no more research, guesswork or measuring—simply fill the diff to the level of the fill hole. The Dana 44 Bombshell™ differential cover is cast from highly ductile nodular iron—the same material drag racing differential housings are cast from to handle thousands of horsepower. The design of the Bombshell™ incorporates recesses to protect the diff cover bolt heads from trail damage, while the profile of the Bombshell™ acts as a ramp to help slide your Jeep up and over the most troublesome pumpkin-eaters. The ramp profile also results in an extremely thick& up to 1" thick—cross-section around the bolt ring, where contact with the rocks is most likely. Throughout the rest of its cross-section the Bombshell™ is the thickest cast differential cover on the market, from 7/16" to a brutal 1/2" thick at the outermost surface. Here is our entire collection of images for this product. NOTE: Some images depict earlier versions of this product. We're constantly adding more photos so check back often if you don't see a shot with a specific angle or installation you are looking for. Do you own this item already? We'd love to have your photos to add to our collection. Just send the hi-res images via email to sales@poisonspyder.com. 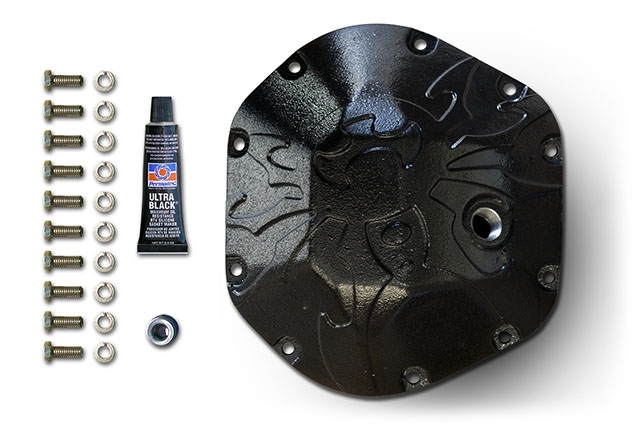 Now Fits Stock Applications This version of the Bombshell Diff Cover has been re-designed to fit all applications including stock Jeep Wrangler JK's and TJ's without aftermarket suspension components. Q: Can the Dana 44 Bombshell be used on a STOCK Jeep Wrangler? A: This is a newly re-designed version of the Bombshell that is designed to fit all Jeep Wrangler applications, even those without suspension modifications. In other words, it will fit on a bone stock Jeep Wrangler right off the showroom floor. Earlier versions of the Dana 44 Bombshell did require an aftermarket Track Bar to ensure there would be no contact on full compression. A: This version of the Dana 44 Bombshell has the fill hole located at the proper fluid level. Simply fill it to the level of the fill hole for the correct quantity of lubricant. This quantity will vary slightly depending on the amount of oil displaced by different types of lockers/carriers, but filling to the level of the fill hole always result in the proper amount.